The Lockheed Constellation ("Connie") was a propeller-driven airliner powered by four 18-cylinder radial Wright R-3350 engines. It was built by Lockheed between 1943 and 1958 at its Burbank, California, USA, facility. A total of 856 aircraft were produced in four models, all distinguished by a triple-tail design and dolphin-shaped fuselage. 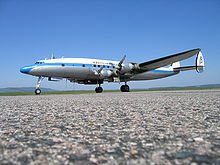 The Constellation was used as a civilian airliner and as a U.S. military air transport, seeing service in the Berlin Airlift. It was the presidential aircraft for U.S. President Dwight D. Eisenhower. Since 1937, Lockheed had been working on the L-044 Excalibur, a four-engine pressurized airliner. In 1939, Trans World Airlines, at the instigation of major stockholder Howard Hughes, requested a 40-passenger transcontinental airliner with 3,500 mi (5,630 km) range - well beyond the capabilities of the Excalibur design. 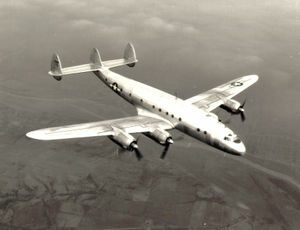 TWA's requirements led to the L-049 Constellation, designed by Lockheed engineers including Kelly Johnson and Hall Hibbard. Willis Hawkins, another Lockheed engineer, maintains that the Excalibur program was purely a cover for the Constellation. Picture - A preserved C-121C Super Constellation, registration N73544, in flight in 2004. 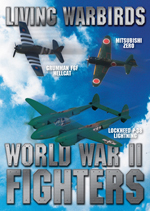 The Constellation's wing design was close to that of the P-38 Lightning, differing mostly in scale. The distinctive triple tail kept the aircraft's overall height low enough to fit in existing hangars, while new features included hydraulically-boosted controls and a thermal de-icing system used on wing and tail leading edges. The aircraft had a top speed of over 340 mph (550 km/h), a cruise speed of 300 mph (480 km/h), and a service ceiling of 24,000 ft (7,300 m). Picture - The first Lockheed Constellation on January 9, 1943. Lockheed proposed the model L-249 as a long range bomber. It received the military designation XB-30 but the aircraft was not developed. A plan for a very long-range troop transport, the C-69B (L-349, ordered by Pan Am in 1940), was canceled. A single C-69C (L-549), a 43-seat VIP transport, was built in 1945 at the Lockheed-Burbank plant. Trans World Airlines opened post-war commercial intercontinental air service on February 6, 1946, with a New York-Paris flight in a Constellation. On June 17, 1947, Pan American World Airways opened the first ever regularly-scheduled around-the-world service with their L749 Clipper America. The famous flight Pan Am 1 operated for nearly 40 years. As the first pressurized airliner in widespread use, the Constellation helped to usher in affordable and comfortable air travel. Operators of Constellations included TWA, Eastern Air Lines, Pan American World Airways, Air France, BOAC, KLM, Qantas, Lufthansa, Iberia Airlines, Panair do Brasil, TAP Portugal, Trans-Canada Airlines (later renamed Air Canada), Aer Lingus and VARIG. The Constellation proved prone to engine failures (due to her R3350s), earning the nickname "World's Finest Trimotor" in some circles. The advent of jet airliners, with the de Havilland Comet, Boeing 707, Douglas DC-8 and Convair 880, rendered the piston-engined Constellation obsolete. The first routes lost to jets were the long overseas routes, but Constellations continued to fly domestic routes. The last scheduled passenger flight in the 48 states was made by a TWA L749 on May 11, 1967 from Philadelphia to Kansas City, MO. However, Constellations remained in freight service for years to come, and were used on backup sections of Eastern Airlines' shuttle service between New York, Washington, and Boston until 1968. Picture - Super Constellation at Charles Prince Airport, Rhodesia (now Zimbabwe) in 1975. Used as a flying club headquarters. The Breitling Super Constellation, Swiss watch manufacturer Breitling, sponsored a restoration of a C-121C Super Constellation, registration N73544, that is based in Basel and has since been featured in its advertisements. An L-1049H Constellation that was built originally in 1957, stored for several years and then delivered to cargo carrier Slick Airways was restored in 1986 by the Save-a-Connie, Inc. organization in Kansas City, Missouri, now known as the Airline History Museum. Originally painted in red and white with Save-a-Connie it was later repainted in the 1950s livery of TWA to resemble its original "Star of America" Constellation. The aircraft appeared at New York's John F. Kennedy International Airport at the original TWA terminal designed by Eero Saarinen to commemorate the 75th anniversary of the airline with the paint job donated by TWA in Kansas City for the occasion. The "Star of America" has appeared at many airshows and was even used in The Aviator, the 2004 film depicting the life of TWA's one-time owner Howard Hughes, the man often credited with helping design and develop the original Constellation series. After being grounded for the past few years, Star of America is currently being returned to airworthiness and is expected to appear at 2009 air shows. An L-1049G Super-Constellation in Lufthansa livery and with historic D-ALEM call letters is on display on the Munich International Airport, Munich, Germany, representing Lufthansa's first long-haul aircraft of 1955. One Super Constellation is parked on an unused runway in the Rafael Hernx�ndez Airport in Aguadilla, Puerto Rico. It was struck by a runaway DC-4 at Aguadilla-Borinquen Airport, on February 3, 1992, resulting in damage to the right wing and main spar. 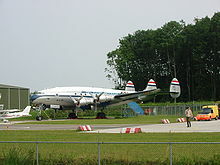 The Dutch National Aviation museum Aviodrome acquired a VC-121A Constellation. It was restored to airworthy condition and ferried from Tucson, AZ to the Netherlands, where restoration continued. It is now painted in the KLM livery of the 1950s, depicting a KLM Lockheed L-749A. Thanks to a donation by Korean Air, who donated two airworthy engines, this aircraft is scheduled to be flying again in the summer of 2009. Renamed Flevoland, this is the only flying example of the "short" version of the Constellation. HL4003 of former Korean National Airlines is displayed in Jeongseok Airport in Jeju island, South Korea. The current owner, Korean Air keeps this aircraft in an airworthy state. While transporting the aircraft from Seoul to its present location, it flew by itself. Federal registration N9412H (delivered as Air France's first Constellation June 1946 as L049 F-BAZA) is parked adjacent to a flight school and cafe at Greenwood Lake Airport in West Milford, New Jersey. It was sold to Frank Lembo Enterprises in May 1976 for $45,000 for use as a restaurant and lounge, and flown into the airport in July 1977. It was sold to the State of New Jersey along with the airport in 2000, and the interior was refurbished and used as a flight school office in 2005. Two L-1649A Super Stars N7316C c/n 1018 and N8083H c/n 1038 are parked on private land next to the Lewiston-Auburn Municipal Airport in Auburn, Maine. The two aircraft were purchased at auction by the Deutsche Lufthansa Berlin Foundation. Lufthansa Technik North America has built a hangar at the airport which will used to overhaul N7316C to airworthy condition. The target date for completion of the overhaul is October 10, 2010. L-049 Serial Number: 42-94549 Registration: N90831 Markings: Trans World Airlines, 1950 - displayed in outdoor exhibit at Pima Air & Space Museum, Tucson, Arizona. L-749 c/n 2503 is in the Mus�e de l'Air et de l'Espace (The Museum of Air and Space) located in Le Bourget Airport, 10 km north of Paris. Parked in museum storage area since 1975 in good condition with minimal corrosion. Ex-Pan American � Clipper America � del. 6 June 1947 reg. N C86520; to Aerovx�as Guest Mexico (XA-GOQ 01/1948), Air France from 01/1949 to 10/1960 as F-BAZR; CGTM (Compagnie G�n�rale des Turbo-Machines) as F-ZVMV for use as flying engine test until December 1974. L1049G Super Constellation (Super Connie) with markings CF-RNR and operated by Trans Canada Airlines from 1954 to 1960s. Sold and later retired in Montreal by 1965. Renovated as a restaurant and bar in and around the Montreal area. Sold and moved again to Toronto and used as convention facility by the Regal Constellation Hotel. Sold again and stored at Toronto Pearson International Airport. Finally sold and restored in Rome, New York and shipped to the Museum of Flight in Tukwila, Washington. L-1049 C c/n 4519 F-BGNJ, formerly a C version, delivered to Air France on November 2, 1953, is undergoing a complete restoration for static display by the Amicale du Super Constellation located in Nantes Airport. It was upgraded to a L-1049 G in 1956 and kept on circling the world until August 8, 1967, having totaled 24,284 hours under Air France's colors. The aging Connie was discarded from the fleet and sent to Spain, to be registered EC-BEN. It briefly flew humanitarian and medevac missions in Biafra, a precursor of Aviation sans frontix�re that appeared later. Air Fret bought it in 1968, brought it back home to France to have it registered as F-BRAD and operated it on cargo hauls until 1974, when the Constellation landed in Nantes one last time, bound to be cut in pieces and sold for scrap. It was ultimately saved by Mr Gaborit, who revamped it somewhat by his own modest means to finally park it near the terminal, accessible to visitors for a few years, until the Chamber of Commerce and Industry of the Nantes-Atlantique Airport bought it, to contract the Amicale du Super Constellation to undergo a complete restoration of the old aircraft. A Lufthansa L1049G Super Constellation serial number 1049G4604, registration D-ALIN, is on display at the Flugausstellung Hermeskeil, near Hermeskeil, Germany. This is the actual aircraft with which Konrad Adenauer flew to Moskow in 1955 to negotiate the release of German POWs. One Constellation is on static display in front of the "Fantasy of Flight" attraction in Lakeland, Florida. Picture - President Dwight D. Eisenhower flew in two Constellations, named Columbine II and Columbine III. Two Constellations, the VC-121E Columbine III (s/n 53-7885), used as Dwight D. Eisenhower's presidential aircraft, and an EC-121 Warning Star (s/n 53-555) are fully restored and on display at the National Museum of the United States Air Force at Wright-Patterson Air Force Base near Dayton, Ohio. Columbine III was retired to the Museum in 1966, and is displayed in the Museum's Presidential gallery. 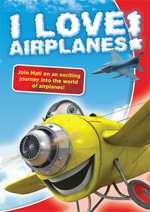 The interior of the aircraft is open to the public. The EC-121 Warning Star is on display in the Museum's Modern Flight Gallery. C-121A serial number 48-0613 (Bataan) is on display at Planes of Fame in Valle, Arizona. This Constellation is in flying condition. According to the Museum's website, this aircraft was used as a personal transport by General Douglas MacArthur during the Korean War, and later by other Army general officers until 1966, when it was retired and transferred to the U. S. space agency NASA. After its acquisition by Planes of Fame, it was restored to its original configuration with a "VIP interior." EC-121A serial number 48-0614, markings 7167th Special Air Missions Squadron, Wiesbaden Air Base, Germany, 1951 - One of Dwight D. Eisenhower personal transports - displayed in outdoor exhibit at Pima Air & Space Museum, Tucson, Arizona. EC-121T, serial number 52-3425, is on display at the Peterson Air and Space Museum at Peterson AFB in Colorado Springs, Colorado. Previously assigned to the 966th AEWCS at McCoy AFB, Florida and then the 79th AEWCS at Homestead AFB, Florida, it was the last operational EC-121 and was deployed by the 79th AEWCS to NAS Keflavik, Iceland. It was delivered to Peterson AFB in October 1978. Picture - N4257U on display at the Combat Air Museum in Topeka, Ks. EC-121T serial number 53-0554, with markings from the 79th Airborne Warning and Control Squadron, Homestead AFB, Florida, 1974 is displayed in the outdoor exhibit at Pima Air & Space Museum, Tucson, Arizona. RC-121D serial number 52-3418 (N4257U c/n 4336 federal registration) was delivered to USAF, October 1954. Then it was redesignated EC-121D 1962, converted to EC-121T but the upper radome was not removed. Reassigned to USAF Reserves at Homestead AFB, FL by July 1974, it was retired and flown to Davis Monthan AFB for storage on 7 April 1976. Reassigned to the Combat Air Museum, Topeka, Kansas on March 1981 as N4257U, the RC-121D was ferried to Topeka, Kansas on June 1981 with Frank Lang in command. IN315, an Indian Navy L1049G (former Air India L1049E VT-DHM 'Rani of Ellora') Super Constellation is on display at the Naval Aviation Museum at Dabolim in Goa, India. September 18, 1945: A USAF C-69 was damaged beyond repair after a wheels up landing following engine problems at Topeka, Kansas, United States. December 28, 1946: TWA Flight 6963 crashed attempting to land at Shannon Airport, Ireland. May 11, 1947: TWA NC86508, c/n 2029, crashed near the Brandywine Shoal lighthouse, Cape May, New Jersey at 8:45 a.m. EST while conducting practice emergency landing procedures, killing all four crew on board. April 15, 1948: Pan Am Flight 1-10 crashed attempting to land at Shannon Airport, Ireland. October 20, 1948 KLM PH-TEN crashed near Prestwick Airport, Scotland, killing all 40 passengers and crew on board. July 28, 1950: Panair do Brasil aircraft registration NC88862, tail number PP-PCG crashed on the Chap�u Hill (29�50′12.25″S 51�6′18.03″W﻿ / ﻿29.8367361�S 51.1050083�W﻿ / -29.8367361; -51.1050083) after an aborted landing, killing 46 passengers and 10 crew. June 22, 1951: Pan Am Flight 151 crashed into terrain, killing all aboard. July 27, 1955: El Al Flight 402 was shot down over Bulgarian airspace, killing all aboard, seven crew and 51 passengers. May 1, 1959: Capital Airlines Flight 983 ground looped and caught fire after landing at Kanawha Airport, Charleston, West Virginia, United States, one passenger and one crew member died. November 8, 1961: Imperial Airlines Flight 201/8 was destroyed followed an attempted emergency landing at Byrd Airport, Richmond, Virginia, United States, 74 passengers and two crew died. March 1, 1964: Paradise Airlines Flight 901A was a controlled flight into terrain following an abandoned approach to Tahoe Valley Airport, California, United States, all 85 on board killed. December 4, 1965: Eastern Air Lines Flight 853 (N6218C), a Lockheed Super Constellation en route from Boston Logan International Airport to Newark International Airport, collided was involved in a mid-air with Trans World Airlines Flight 42 (N748TW), a Boeing 707-131B en route from San Francisco International Airport to John F. Kennedy International Airport, over Carmel, New York, USA. October 28, 1949: An Air France Lockheed L-749 Constellation crashed into the Monte Redondo (Sx�o Miguel Island, Azores), all 11 crew members and 37 passengers on board died, including French boxer Marcel Cerdan and the famous French violinist Ginette Neveu, while approaching the intermediate stop airport at Santa Maria. August 31, 1950: TWA Flight 903 "Star of Maryland" crashed 65 miles from Cairo, killing all 55 people on board. November 3, 1950: Air India Flight 245 "Malabar Princess" (VT- CQP) carrying 40 passengers and eight crew were flying on the Bombay-Cairo-Geneva-London route when it crashed into Mont Blanc, the highest mountain in Western Europe, all on board being killed. 19 July 1951: Eastern Airlines Flight 601 (see photo), operated by Lockheed L-749A Constellation] N119A suffered severe buffeting after an access door opened in flight. A flapless wheels-up landing was made at Curles Neck Farm, Virginia. The aircraft was later repaired and returned to service. 19 October 1953: an Eastern Airlines flight from Idlewild International Airport to San Juan, Puerto Rico, operated by Lockheed L-749A Constellation N119A crashed on takeoff. Two passengers were killed. April 11, 1955: Air India L-749A "Kashmir Princess" (VT-DEP) was bombed in midair, 16 of the 19 on board died. On July 28, 1969: L-749A 5N85H c/n 2662 crashed in Mount Toubkal, Atlas Mountains, Morocco, 60 miles south of Marrakesh, all eight on board dying. The Constellation, that was carrying weapons to Biafra, was discovered about a year later on July 18, 1970 by mountaineers. September 5, 1954: KLM Flight 633 crashed on takeoff from Shannon, Ireland, killing 28 of the passengers. October 30, 1954: United States Navy Flight 57 crashed into the Atlantic Ocean, killing all 42 passengers and crew. June 30, 1956: TWA Flight 2 was struck by United Airlines Flight 718 (a Douglas DC-7) over the Grand Canyon. It broke apart and crashed; 70 people on board died. Flight 718 crashed nearby, resulting in the deaths of 58 on board. August 14, 1958: KLM Flight 607-E crashed on takeoff from Shannon, Ireland, killing all 99 aboard. January 11, 1959: Lufthansa flight 502, a Lockheed L-1049G Super Constellation registration D-ALAK flying from Hamburg to Rio de Janeiro-Galex�o via Frankfurt, Paris-Orly and Dakar, crashed during approach under heavy rain at Rio de Janeiro. The crew descended below minimums. From the 39 passengers and crew aboard, three survived. This was the first accident of Lufthansa after it was re-established. January 21, 1960: Avianca Flight 671, an L-1049E, crashed and burned on landing at Montego Bay International Airport in Jamaica, resulting in the deaths of 37 aboard. August 24, 1960: A Qantas L-1049G, VH-EAC, c/o 4606, during takeoff from runway 13 at Plaisance International Airport Mauritius, engine number 3 lost power just before reaching the V1 speed of 115 knots. 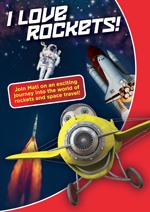 The captain pulled off the power, braked hard, and pulled selected reverse thrust. The aircraft however, did not decelerate as expected. The flight engineer feathered the number 3 engine and pulled its emergency shut-off valve. The Super Constellation, named "Southern Wave", could not be brought to a stop on the remaining runway and overran the runway at a speed of 40 knots. The Super Constellation bounced over a low embankment, crashed into a gulley and caught fire. Of the 38 passengers and 12 crew all survived the crash. December 16, 1960: TWA Flight 266 was struck by United Airlines Flight 826 (a Douglas DC-8) over Staten Island, New York. It broke apart and crashed, with 44 on board dying. Flight 826 soon crashed in Brooklyn, New York, 84 people on board and six on the ground were killed. March 16, 1962: Flying Tiger Line Flight 739, an L-1049H, was lost over the Pacific, all 107 aboard presumed lost. September 2, 1963: A Iberia Airlines L-1049 hit trees and almost crashed in Surrey, England on approach to Gatwick Airport. The pilots safely landed the aircraft with some damages to it. August 5, 1973: A Happy Hours Air Travel Club L-1049, N6202C, c/o 4002, lost power on all four engines due to fuel starvation and made a forced landing in Tamarac, Florida on approach to Fort Lauderdale. 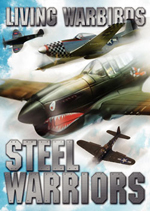 The aircraft was damaged beyond repair. May 10, 1961: An Air France L-1649 nicknamed "De Grasse" suffered an explosion in flight and crashed in the Algerian Sahara. All nine crew and 69 passengers were killed. Lockheed Constellation Pictures and Lockheed Constellation for Sale.